Highly detailed and made with high quality fabrics to look like black bears across North America, our black bear stuffed animal is overstuffed to achieve a sitting pose. A real showpiece and a perfect addition to any den. Cuddlekins stuffed animals by Wild Republic are by far the most adorable plush animals currently on the market. 12 inch Snowy Owl with all white face. God asked Noah to build an Ark and fill it with two of every kind of animal. Noah obeyed, guiding all the animals on the Ark, including zebras, giraffes, elephants, even dogs and bunny rabbits! The rain began to pour for 40 days and 40 nights, then God made the sun shine and dried up all the rain. All the animals got off the Ark and roamed the renewed earth! 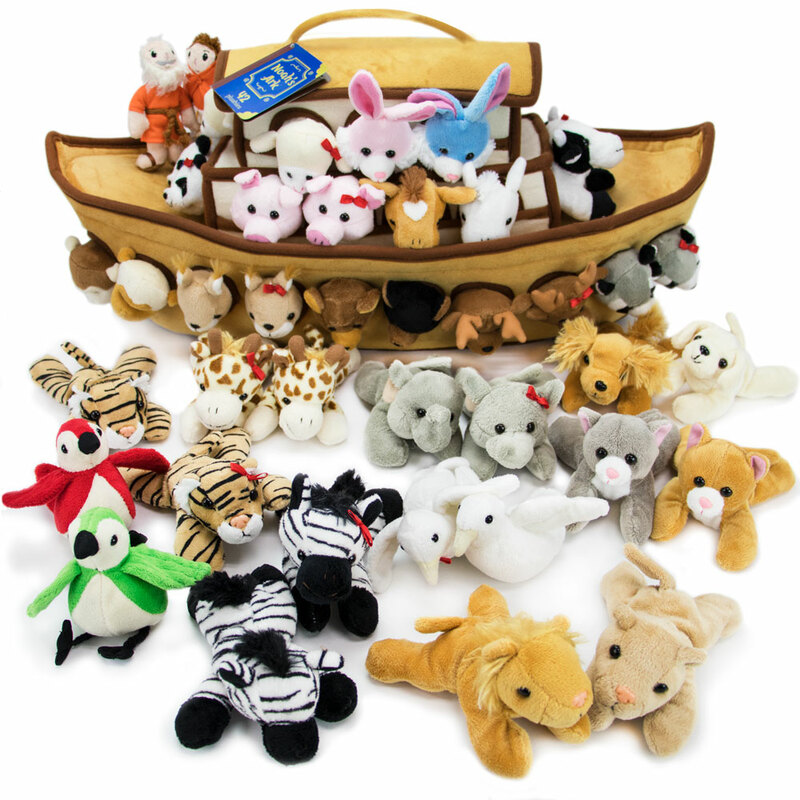 Our Ark is made purely from soft, plush materials. While it isn't quite 300 cubits long, this Ark measures 2 feet long, which is over twice the size of most Ark toys. On top, you'll find a handle to take this playset wherever you go. Each animal measures 4"" for little hands to easily hold and play. With 42 plushies, this toy set is great for little ones to play together in nurseries, daycares, playrooms, and schools. It makes a great gift for birthdays, religious holidays, and baptisms. Along with Noah and his wife, this set comes with two of every animal on the Ark: zebras, giraffes, elephants, tigers, lions, dogs, cats, doves, birds, cows, sheep, pandas, bunnies, pigs, horses, deer, monkeys, bears, moose, and raccoons. Common Loon. Plush squeeze bird which sounds off the real bird call. Enjoyment for kids and adults alike. Mallard. Plush squeeze bird which sounds off the real bird call. Enjoyment for kids and adults alike. Your loved ones will sing for this plush and adorable Ruby-throated Hummingbird! As part of our Award Winning Audubon Birds collection, this Ruby-throated Hummingbird comes with an authentic sound recording provided through a partnership with the Cornell Lab of Ornithology. Each beautifully detailed bird comes with an educational hang tag containing information about its appearance, eating habits, habitat maps and sound information. Measures approximately 5 inches. You will love to cuddle with this soft and adorable Cuddlekins Elk. Each highly detailed Cuddlekins Elk comes with lifelike facial and authentic features. With its ultra-plush stuffing, this Cuddlekins Elk is so cute and huggable. Measures approximately 8 inches. Canada Goose..Size: 5..Recommended for ages 3 and up..Plush squeeze bird which sounds off the real bird call..Enjoyment for kids and adults alike..
Great Horned Owl. Plush squeeze bird which sounds off the real bird call. Enjoyment for kids and adults alike. Mockingbird. Plush squeeze bird which sounds off the real bird call. Enjoyment for kids and adults alike. You will love to cuddle with this soft and adorable Cuddlekins Grey Squirrel. Each highly detailed Cuddlekins Grey Squirrel comes with lifelike facial and authentic features. With its ultra-plush stuffing, this Cuddlekins Grey Squirrel is so cute and huggable. Measures approximately 8 inches. Your loved ones will sing for this plush and adorable Peregrine Falcon! As part of our Award Winning Audubon Birds collection, this Peregrine Falcon comes with an authentic sound recording provided through a partnership with the Cornell Lab of Ornithology. Each beautifully detailed bird comes with an educational hang tag containing information about its appearance, eating habits, habitat maps and sound information. Measures approximately 5 inches. You will love to cuddle with this soft and adorable Cuddlekins Pileated Woodpecker. Each highly detailed Cuddlekins Pileated Woodpecker comes with lifelike facial and authentic features. With its ultra-plush stuffing, this Cuddlekins Pileated Woodpecker is cute and huggable. You will love to cuddle with this soft and adorable Cuddlekins Bison. Each highly detailed Cuddlekins Bison comes with lifelike facial and authentic features. With its ultra-plush stuffing, this Cuddlekins Bison is so cute and huggable. Measures approximately 8 inches. Painted Bunting. Plush squeeze bird which sounds off the real bird call. Enjoyment for kids and adults alike. Purple Martin. Plush squeeze bird which sounds off the real bird call. Enjoyment for kids and adults alike. Oriole. Plush squeeze bird which sounds off the real bird call. Enjoyment for kids and adults alike. Explore nature with these 4 inch W x 4.87 inch H x 1.5" inch D binoculars. Complete with North American themed design, 4.5 x 29 power magnification and focusing knob. You will love to cuddle with this soft and adorable Cuddlekins California Quail. Each highly detailed Cuddlekins California Quail comes with lifelike facial and authentic features. With its ultra-plush stuffing, this Cuddlekins California Quail is cute and huggable. Spread your wings for adventure with this Butterfly Play Set. Our polybag of mini butterfly figurines includes a full kaleidoscope of beautifully colorful winged insects. Let your imagination take flight with this fun collection! Mountain Bluebird. Plush squeeze bird which sounds off the real bird call. Enjoyment for kids and adults alike. Wild Turkey. Plush squeeze bird which sounds off the real bird call. Enjoyment for kids and adults alike. Baby Chick. All authentic bird calls are recorded at the Cornell Lab and licensed by Audubon. Your loved ones will sing for this plush and adorable Western Tanager! As part of our Award Winning Audubon Birds collection, this Western Tanager comes with an authentic sound recording provided through a partnership with the Cornell Lab of Ornithology. Each beautifully detailed bird comes with an educational hang tag containing information about its appearance, eating habits, habitat maps and sound information. Measures approximately 5 inches. Your loved ones will sing for this plush and adorable Eastern Towhee! As part of our Award Winning Audubon Birds collection, this Eastern Towhee comes with an authentic sound recording provided through a partnership with the Cornell Lab of Ornithology. Each beautifully detailed bird comes with an educational hang tag containing information about its appearance, eating habits, habitat maps and sound information. Measures approximately 5 inches. You will love to cuddle with this soft and adorable Cuddlekins Barn Owl. Each highly detailed Cuddlekins Barn Owl comes with lifelike facial and authentic features. With its ultra-plush stuffing, this Cuddlekins Barn Owl is so cute and huggable. Measures approximately 12 inches. Flicker. Plush squeeze bird which sounds off the real bird call. Enjoyment for kids and adults alike.